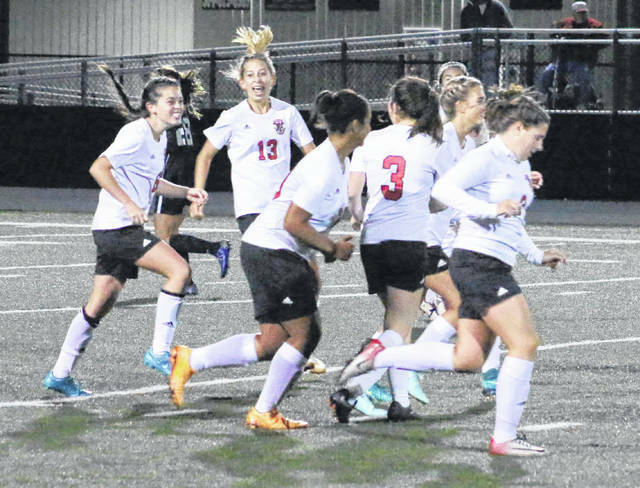 Point Pleasant sophomore Morgan Miller, left, is congratulated by Caitlin Peal (13) and other teammates following a second half goal Tuesday night in a Class AA-A Region IV, Section 1 semifinal against Sissonville in Point Pleasant, W.Va.
POINT PLEASANT, W.Va. — The quantity eventually led to quality. 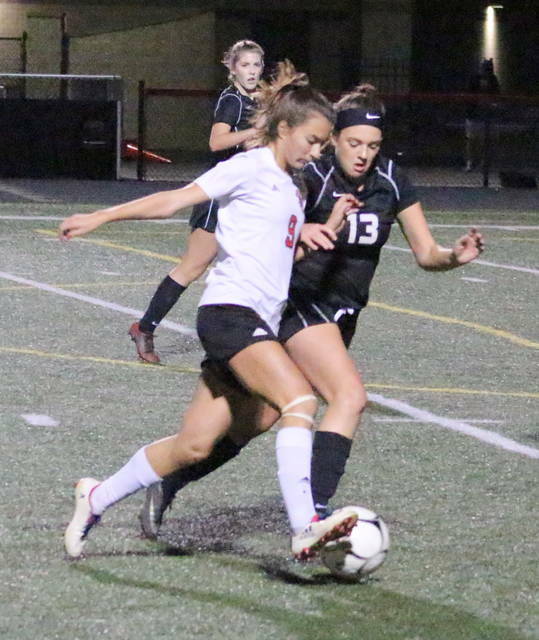 The Point Pleasant girls soccer team produced four times as many shot attempts than visiting Sissonville and never trailed en route to a 2-1 victory Tuesday night in a Class AA-A Region IV, Section 1 semifinal match at Ohio Valley Bank Track and Field in Mason County. 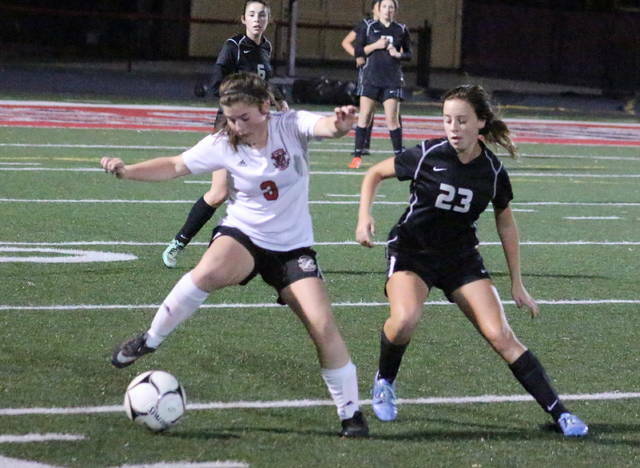 The second-seeded Lady Knights (6-9-3) averaged a shot every 3:20 in the match after posting a sizable 24-6 advantage in that category, with the hosts also claiming a 9-3 edge in shots on goal. The third-seeded Lady Indians (9-9-2) also struggled early against a pesky PPHS defense that allowed zero shots on goal in the first half. In fact, SHS mustered its first shot attempt of the game with seven minutes left before the intermission. However, despite such a dominant performance through 40 minutes, the Lady Knights led only 1-0 at the break. 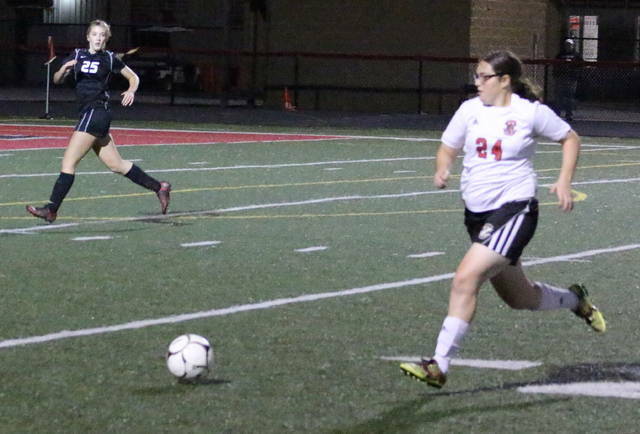 Point Pleasant owned a 10-2 shot advantage through 30-plus minutes of play, but the hosts had nothing to show for their efforts as part of a scoreless tie. 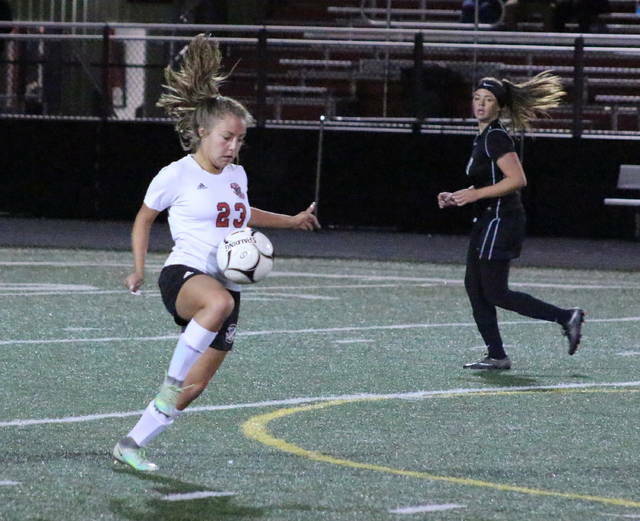 The 11th shot of the game for PPHS proved to be beneficial as senior Caitlin Peal headed in a goal between three defenders, following a corner kick from the right side. Peal’s heroics gave the hosts a 1-0 edge with 4:14 remaining in the first half. Sissonville — which was outshot 12-2 in the first half — found a third of its offensive chances during a five-second span early in the second stanza. Amber Smith came up with a point-blank rebound on a free kick and trickled the follow-up past a sliding attempt by PPHS keeper Monica Cook. Smith’s goal tied the game at one with 34:19 left in regulation. The Lady Knights, however, needed just 58 seconds to retaliate as sophomore Morgan Miller buried a shot from 18 yards out. Miller had an open look from the top right corner and went opposite post — past a diving attempt by SHS keeper Sydney Farmer — for a 2-1 edge with 33:21 remaining. Point Pleasant was also a little bit of a victim of bad luck through the night after a pair of really great opportunities came up empty in each half. 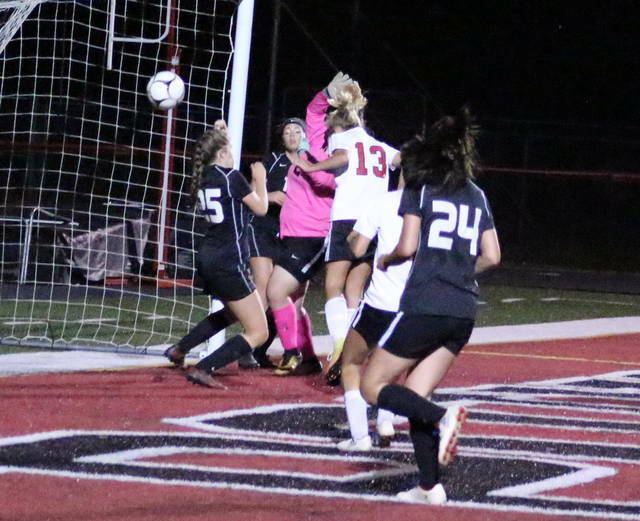 Miller had a 15-yard shot from the top left corner bounce off the cross bar 12 minutes into regulation, then Farmer somehow came away with a save on a point-blank rebound shot by Teagan Hay with just 16 minutes left before intermission. Miller fired just wide of the post from 15 yards out a minute into the second half and also sailed a shot outside the post with 10:40 left in regulation. Regardless, the Lady Knights controlled the game and constantly applied pressure by putting shot attempts up as often as possible. That was something the fifth-year PPHS coach Chris Errett was proud of following the triumph. “The girls played tough tonight. They gave it everything they had and they played well together. They found a way to get it done and get themselves another game,” Errett said. “Getting that early goal was big, but then we had that one breakdown early in the second half. It was good to see the girls respond so quickly and get the lead back, then I was proud of how we made that second lead hold up the rest of the way. The Lady Knights now travel to top-seeded Nitro for the Region IV, Section 1 championship game on Thursday at 5:30 p.m. The Lady Wildcats defeated fourth-seeded Williamstown by an 8-7 count on Tuesday night. Cook made two saves in net for Point Pleasant, which was whistled for five of the six fouls committed in the match. Farmer had seven stops in goal for the Lady Indians, who claimed a 6-2 edge in corner kicks.